I'm totally excited, relieved, nervous, thrilled... and any other adjective you can come up with to describe how it feels when launching a new book! Deep Deceit is finally available on Amazon in both print and Kindle and I'm heading out on tour to spread the word. I'd like to thank all the bloggers who have agreed to participate in my Virtual Book Tour and encourage you to visit their blogs not only on the day they join the tour but make sure you go back and visit regularly! Here is the line-up of blogs I'll be visiting and featured on with interviews, reviews or guest posts. As the posts are live, I'll update the links here to go directly to the post. I look forward to interacting with everyone at all the stops! Book Readers Heaven - kicks off the tour on March 8th! Books, Movies, Reviews... Oh My! ...and many more to come! 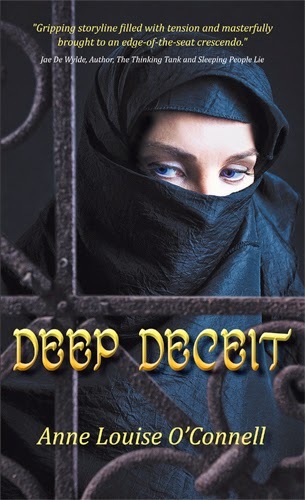 In celebration of Mother's Day, Deep Deceit will be available for free download on Kindle on May 9-10. I could not put it down and go to sleep. I just wanted to know what was going to happen next. Thanks Wendy! I'm so glad you enjoyed it ... since it was dedicated to you ;) Get ready for the Susan Morris Expat Mysteries Series!